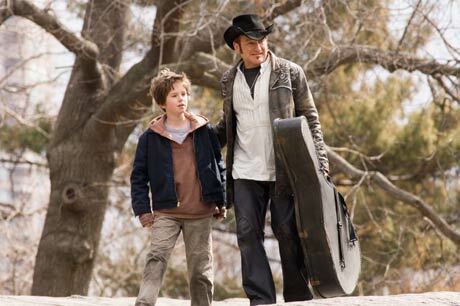 August Rush is the movie Neil Jordan would make if he were a 14-year-old girl and an idiot. Bad enough that the film is a collection of magic realist/love story movie chestnuts but those clichés are then filtered through the sensibility of Kirsten (daughter of Jamie) Sheridan, who cuts so much explanatory detail that she fails completely to make any damn sense. Rocker Jonathan Rhys-Meyers and classical cellist Keri Russell are brought together for a night of cloying romance. They sire a child and are parted, both to abandon their musical dreams for reasons too ridiculous to enumerate here. Their son grows up to be Freddie Highmore, and after suffering grandly in an orphanage winds up in New York to become the ward of the homeless Robin Williams and his band of sassy black transient kids. Freddies a musical genius, of course, and we know this because we are shown montages of the city with the sound jacked up high  he hears music! Everywhere!!! Hes also on a mission to find his parents and bring them together, a feat hell perform through pure magic and on the flimsiest of narrative pretexts. Sheridan ditches any attempt to explain what goes on in the movie and simply gives in to the magical sap that runs through her veins. People do things for reasons they dont understand and which arent explained by the script; the movie is practically dada in its belief in nonsense and commitment to confounding the audience.